Once your family qualifies for hospice care, Above And Beyond can help you find a facility you trust for your loved one’s last days. Hospice care is generally used for patients who have a life expectancy of six months or less. Above And Beyond offers free placement services in the Phoenix area so you can focus on spending time with your loved one and not on finding a location for them to live. Hospice care is intended as end-of-life care and is an emotionally rigorous process for both you and your loved one. Your senior loved one will benefit from a team of health care professionals and volunteers who will look after his or her medical, psychological, and spiritual well-being. 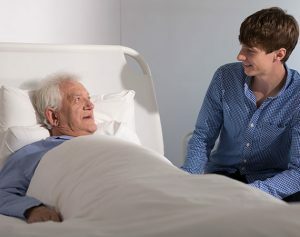 Depending on the needs and health of your loved one, this care can take place at home, at a hospice facility, in a hospital, or in a skilled nursing facility. A doctor can recommend which would be best. Above And Beyond can then help you find the hospice care that matches your budget and emotional needs while meeting the physical needs of your loved one. The end of your loved one’s life isn’t the time you should be stressing and trying to figure out complicated processes. At Above And Beyond, we have more than 20 years of experience in this industry and are skilled at senior placement services here in the Phoenix area. Schedule an appointment with us and let us help you through this time.